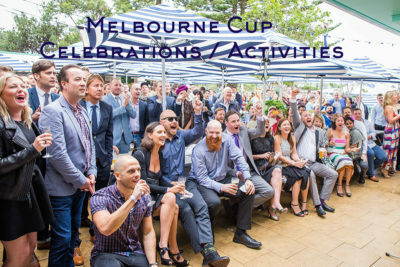 Melbourne Cup events, activities and experiences with a Thrill to line up your staff, employees and clients for the ultimate in un celebrations and games designed for when a race stops the nation! Melbourne’s largest spring carnival and Australia’s biggest Horse Racing event is being galloped from the track right into your office work space. Take a Picnic Day off with Thrill at the helm hosting your Horse Race day with a series of games to bring the Race Carnivale to life. Thrilling races and games transform your corporate offices whilst bonding your workplace in a fun, crazy and extravagant way. Picnics around the stables, gourmet lunches, fully catered with drinks in the office, bar games and activities galore! The Race that stops the Nation delivered to your office in Thrilling fashion. No need for tickets as Thrill takes the race from trackside and gallops it right into your loud and fun work environment. Put those office chairs to good use in games where you ride the winner home, card games that have you cheering louder than the Melbourne Cup winners owner box. – Champions are crowned no matter how big the stage with Prizes for all the events. Mix n Match games. For Fun or Sweepstakes. Build Rocking Horses in a Toys 4 Kids Charities. We supply Hosts for your Melbourne Cup Event takes on all punters and plays games related to Horse Racing Carnival. Horse Card Races – Cheer on your riders suite as it races to the finish in flying colours. Think you can back a winner? We’ll throw you questions and see if you can trot them down! Horse Shoes Ring toss Games with a twist and a throw. Melbourne cup Sweep stakes and championships draws. only 1 hr from Sydney. Fully catered in scenic settings at Horse Ranches. Meet real Horses at Centennial Park, Megalong Valley or Ingleburn Horse Riding Schools to ride your thoroughbred. 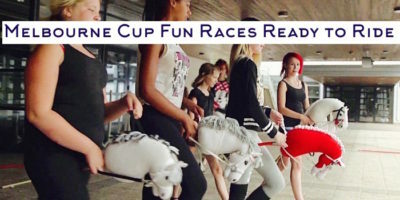 Thrill Melbourne Cup events and celebration activities are custom designed for your group. From corporate and business group staff with 20-100’s even 1000’s of staff in Sydney. The Thrill Experiences team and professional hosts will create a memorable event for your staff to engage and celebrate. Let us do the leg work. With terrific horse talking deals and receive a free 2004 Shiraz Sparkling Red wine from the Hunter Valley’s finest breeds.